A to beware of potential terrorist threats in Europe drew American shrugs Sunday from Paris to Rome, but tourism officials worried that it could deter would-be visitors from moving ahead with plans to cross the Atlantic. The travel alert is a step below a formal warning not to visit Europe, but some experts said it could still hurt a fragile European economy already hit hard by the debt crisis. "I think if someone was looking for an excuse not to travel, then this is just the ticket," says George Hobica, founder of Airfarewatchdog.com. "However, I don't think most people will alter their plans unless the threat is very specific." The State Department alert advised the hundreds of thousands of U.S. citizens living or traveling in Europe to take more precautions about their personal security. 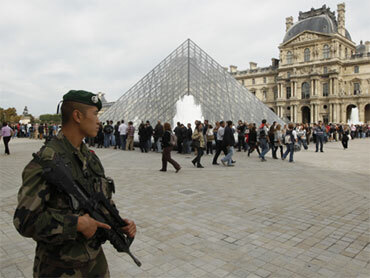 Security officials say terrorists may be plotting attacks in Europe with assault weapons on public places, similar to the deadly 2008 shooting spree in Mumbai, India. Without a specific threat, however, American visitors were not letting the alert disrupt their travels. "We live in New York. So in New York we think about these things all the time," said Richard Mintzer, a 55-year-old American visiting Italy with his wife. "I wouldn't say we are particularly worried in Rome, no more than we would be at home, or anywhere in the Western world." At Paris' spring-summer 2011 ready-to-wear fashion shows, W magazine fashion market director Karla Martinez said she gets "worried for five minutes, but then I forget about it and get back to the job that I'm here to do. "It's a little scary when you're staying in a big hotel with lots of tourists, because we hear that could be a target, but I try not to get too worked up about it," she said. "At the end of the day all you can do is keep your eyes and ears open and try not to be naive." The impact on travel could deepen if the threat highlighted by the Obama administration leads to new, tighter security measures in airports and elsewhere, said Henry Harteveldt, a travel analyst for Forrester Research. But the U.S.-based Air Transport Association, a trade group for the airline industry, said it expects "business as usual." United, Continental and Delta said they were operating as usual on Sunday without any cancellations or delays related to the terror alert. The airlines said customers will be charged the usual penalty if they want to change itineraries. Kevin Mitchell, chairman of the Business Travel Coalition, said business travelers will likely keep their plans and hold onto nonrefundable tickets as long as the warning remains "fairly general." "The biggest impact will be those people who right now haven't yet made their plans," Mitchell said. "They're the ones who will forestall their decision until the situation is a little bit more clear." The travel alert noted in particular "the potential for terrorists to attack public transportation systems and other tourist infrastructure." "Current information suggests that al Qaeda and affiliated organizations continue to plan terrorist attacks," it said. "European governments have taken action to guard against a terrorist attack and some have spoken publicly about the heightened threat conditions." Democratic U.S. Sen. Charles Schumer stressed to reporters after talking to State Department and Justice Department officials that the alert "means be careful when you go, but they are not advising you not to go." Peter Terpstra, a tourism analyst at the Swedish Agency for Economic and Regional Growth, said the warning could dampen the recent upswing of visitors from the U.S. to Sweden - boosted in part by the success of Swedish crime novels that have generated an exciting image of the Nordic nation. In Paris, Texan tourist Frederico Reimers was afraid his flight back home might be canceled, but said the scene at the airport showed "everything is running pretty good." The U.S. advisory itself might be "a little bit exaggerated, but, oh well, what can you do," Reimers said. U.S. and European security experts have been concerned for days about a terror attack similar to the one in Mumbai, which left 166 people dead and targeted two luxury hotels, a Jewish center, a popular restaurant and a crowded train station. Britain's Foreign Office on Sunday began warning British travelers to France and Germany that the threat of terrorism in those countries is high. Britain's Home Secretary Theresa May said the threat of terrorism in the U.K. remains unchanged at "severe," meaning an attack is highly likely. Germany's Interior Ministry said it saw no need to change its assessment of risks to the country and there were "still no concrete indications of imminent attacks" there. France's interior minister said the threat of a terrorist attack is real but that the country is not raising its alert level. "The terrorist threat exists, and could hit us at any moment," the French defense minister, Herve Morin, said in an interview published Sunday. "Networks organizing themselves to prepare attacks are constantly being dismantled around the world. It is good for the French to know this," he was quoted as saying in the daily Le Parisien. A French official said Sunday that Italian police had arrested a Frenchman suspected of links to a network recruiting fighters for Afghanistan. The man was arrested in Naples in southern Italy in early September, based on a French probe underway for several months into alleged involvement in a terrorist enterprise, the official said. The official was not authorized to be publicly named because terrorism cases are classified. The U.S. notice said terrorists "may elect to use a variety of means and weapons and target both official and private interests" and noted past attacks against subways, rail systems and aviation and maritime services. "U.S. citizens should take every precaution to be aware of their surroundings and to adopt appropriate safety measures to protect themselves when traveling," according to the alert. The alert wasn't intended to urge travelers to stay away from public places. It fell short of a formal travel warning, which could have had broader implications including a stronger likelihood of canceled airline and hotel bookings and the suspension of many U.S. college and university study-abroad programs. Despite concerns that the alert could cause a European travel slump, there was no strong opposition it from European leaders, who privately have been advised of the impending action, a European official said. Marietta Rough, a British tour guide in Berlin, said being concerned about terrorism while traveling has simply become something everyone has to live with. "It shouldn't affect your daily life, and I certainly don't feel like it is here in Berlin," she said. U.S. intelligence officials believe Osama bin Laden is behind the plan to attack several European cities. If true, this would be the most operational role that bin Laden has played in plotting attacks since Sept. 11, 2001. Eight Germans and two British brothers are at the heart of an al Qaeda-linked terror plot against European cities, but the plan is still in its early stages, with the suspects calling acquaintances in Europe to plan logistics, a Pakistani intelligence official said last week. One of the Britons died in a recent CIA missile strike, he said. The Pakistani official said the suspects are hiding in North Waziristan, a Pakistani tribal region where militancy is rife and where the U.S. has focused many of its drone-fired missile strikes.